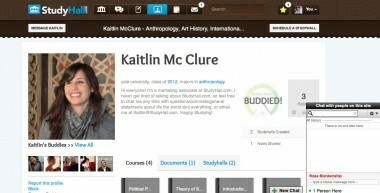 A new course management site, StudyHall, is looking to take current standard Blackboard to school. 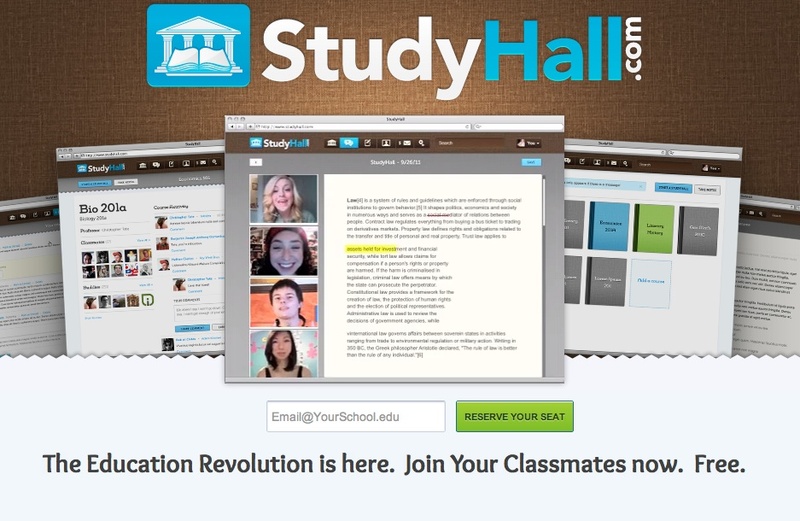 But StudyHall, which launches today, is taking a populist approach with its system: Students only, no professors allowed. StudyHall users can create Facebook-like profiles with pictures of themselves and a list of groups and interests. The site, which is free to join, suggests potential buddies both on campus and at other schools that students might want to link up with. Unlike Facebook, StudyHall’s goal is to focus less on social and more on academics, with digital notebooks indicating which courses users are taking and which books they’re using. There’s a designated Notes section, in which users can post their class notes and control who they’d like to share them with; and, naturally, users can schedule a Study Hall — a collaborative online work session. StudyHall is the brainchild of entrepreneurs Ben Winter and Ross Blankenship, who have received around $500,000 in early funding from a group of undisclosed investors. Winter and Blankenship envision StudyHall becoming a peer-to-peer book-selling market as well, with StudyHall getting a small percentage of each transaction made. While StudyHall has officially launched, it’s currently not available to any and all college students. Winter and Blankenship have been trying to get the word out through campus officials and orientation leaders, and say they hope to roll the site out by mid-September to five (elite) schools: Harvard, Yale, Georgetown, Middlebury and Cornell. It’s hardly the first company to try to offer an alternative to Blackboard. And it could face some interesting hurdles as it looks to grow. Blackboard first launched in 1997, and for the past decade or so has been the leading Web site for students and teachers to access coursework and share notes. Its legacy product, Blackboard Learn, is currently used by more than 3,200 colleges and universities across the U.S., the company says, and has a large international footprint, as well. After Blackboard went private last year, it began to focus on growth through acquisition — most recently by buying Moodlerooms — and has made some inroads in the K-12 market. Blackboard also introduced mobile apps across all platforms, seeing that more and more students were using iPads and smartphones as study tools. An example of a StudyHall profile. StudyHall currently doesn’t have any mobile apps to offer, but says both iOS and Android apps are in the works. More importantly, Blackboard is set up through client agreements with institutions, which then make Blackboard available to professors and students at the course level. Basically, where Blackboard is available, it’s got the administrative seal of approval, whereas StudyHall is looking to eschew the administrative process by making the site a destination for students only. “We want StudyHall to be a place where students can post, ‘Hey, did you understand what the professor was saying today?’ or ‘Did anyone take good notes? I was hungover and missed class,’ without repercussion,” Winter said in an interview. Winter and Blankenship concede that a legitimate concern is StudyHall becoming a forum for cheating, and that some administrators they’ve met with bristle at the words “collaborative” and “student-only” for that reason. “We’re going to be very proactive removing content that’s flagged as fraudulent, and if a school reached out to us looking for a digital footprint of a student accused of cheating, we would, in a controlled manner, help them with that issue,” Winter said. He also pointed out that the academic property of universities — which includes syllabi — can’t be uploaded to StudyHall, and that such restrictions will be clearly marked to students.